"Cool, clever, crazy, but becomes too clever for its own good or bad, depending on how you look at the world"
One of the things that stands out about this film is the cool style. Director Drew Goddard utilizes title cards as transitions in the film. Sticking with this tradition, we thought we would do the same with the review of Bad Times at the El Royale. The El Royale used to be a celebration of the differences between the great states of California and Nevada. The innovative concept used to be a draw for people who wanted to escape the glitz and glamour of the gambling hub of Reno. Decades on in its existence, the once famed hotel has fallen into disrepair and has become a haven for those who want their actions to remain unknown and their identities to remain anonymous. On a rainy night, four strangers check into the broken down resort as they attempt to determine the next step in their lives. Seymour Sullivan (Jon Hamm), an overly demonstrative vacuum salesman, Darlene Sweet (Cynthia Erivo), a struggling lounge singer, Father Daniel Flynn (Jeff Bridges) and the mysterious Southern woman, Emily Summerspring (Dakota Johnson) all check in with the hope of a quiet, uninterrupted evening. Once the concierge registers each guest, there is evidence that each person is not who they claim to be and that the hotel holds secrets that will inevitably link them to one another. Leading to a visit from Billy Lee (Chris Hemsworth) a larger than life cult leader who is looking for something that one of the guests took from him. 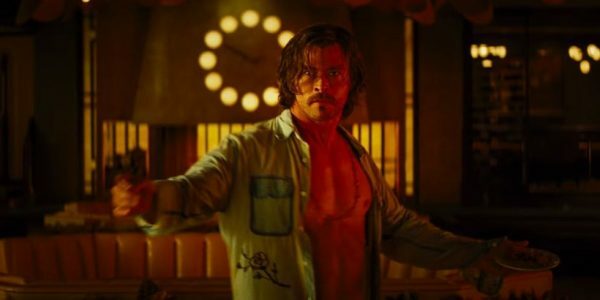 With the mix of characters and the bizarre storyline and setting, Bad Times at the El Royale has the potential for the extremes of brilliance or to become a dog’s breakfast. The result of this polarizing film is that it falls squarely in the middle of both extremes as a creative and captivating visual festival that turns into an all-you-can-eat salad bar experience that will leave audiences mystified at what they just watched. Goddard has a style and vision that are captivating and draw the viewer into every segment of the story. Despite distasteful and uncomfortable situations throughout the journey, the visual detail that is taken to set up this masterful show and allows the motel to become one of the characters in the ensuing drama. Then to add these well-crafted characters into the story makes for a tantalizing set up to the adventure. Bridges and Hamm are well suited for their roles and seem to relish the over the top nature of the script. The on-screen standouts are the newcomers amongst the veteran actors, Cynthia Erivo and Lewis Pullman who breathe an innocence and quiet confidence into the relatively dark tale of redemption and forgiveness. Complementing the spiraling twists that move toward the inevitable conclusion which will challenge viewers to consider where they stand in their morality. For those who are looking to check into the El Royale in the future, they will want to make sure to evaluate their moral positions in life and prepare themselves for a graphic display that will leave them with more questions than answers in the end.